Iran Daily, Sept 25: Rouhani Meets Britain’s Prime Minister — Will It Bring Tehran into Iraq “Coalition”? The headline of President Rouhani’s diplomatic offensive in New York on Wednesday was a meeting with British Prime Minister David Cameron. Beyond the photo opportunity and the cordial greetings, the discussion — the first between British and Iranian Heads of Government since the 1979 Islamic Revolution — may have been a significant negotiation over Iran’s position on the US-led “coalition” in Iraq challenging the Islamic State. Iranian State outlet Press TV highlights the possibility with the complimentary headline, “UK: Iran Part of Solution to Fight ISIL [the Islamic State] in Syria”. Iran’s leaders could help in defeating the threat from the Islamic State…. [They] could help secure a more stable, inclusive Iraq, and a more stable, inclusive Syria. In recent weeks, Iranian officials and media have denounced the US steps in Iraq, claiming that Washington created the Islamic State. At the same time, the Supreme Leader has claimed that Washington approached Iran — both directly and through intermediaries — for its involvement in the effort against the jihadists, an appeal rebuffed by Tehran. British media noted the meeting on Thursday but without the attention to Iran’s possible involvement in the coalition against the Islamic State — and with no indication of a shift in London’s position on Syria. Instead, the focus is on Cameron’s initiative to get British participation in the airstrikes in Iraq, with Parliament convening on Friday to discuss authorization. Press TV’s treatment of the Cameron-Rouhani meeting also ignores the continuing obstacles to the President inside Iran. Well-placed EA sources say that while the President was able to meet French President Francois Hollande and then the British Prime Minister, his plan to follow with a high-profile discussion with President Obama was vetoed by hardliners in Tehran, possibly with the unspoken support of Ayatollah Khamenei. perhaps significantly, Fars News — the outlet of the Revolutionary Guards — is not as enthusiastic about the Rouhani-Cameron meeting. 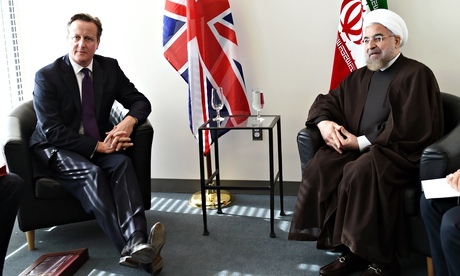 Its brief summary makes no mention of the Prime Minister’s words on Iran’s role in Iraq and Syria. America’s president announced in a speech the other day that, since the Syrian government does not have the capability to destroy the threat, America will step in personally. Do you really think anybody in the world actually believes your claim? A senior commander in the Revolutionary Guards, General Amir Ali Hajizadeh, has hailed Iran’s military involvement in Iraq. Hajizadeh said the head of the elite Qods Force, Qassem Soleimani, and 70 of his forces helped Kurdish fighters block an Islamic State advance on the Iraqi Kurdistan capital Erbil this summer. Since the Islamic State’s offensive in June, Iranian officials have repeatedly denied reports — including one of up to 2,000 troops and militias in Iraq, with Soleimani advising Iraqi leaders — of military involvement. However, as it faces US intervention, Iran has begun heralding its “advisory” presence. Videos and photographs circulated of Soleimani with Iraqi forces after they lifted the siege of Amerli in northern Iraq this month. Hajizadeh said on State TV, “If it were not for Iran’s help, the Islamic State would have captured Kurdistan. Our respected General…Soleimani stood up to IS with only 70 forces and did not allow them to enter Erbil. The commander’s comments appear to be part of an effort by Tehran to “win” Iraqi Kurdistan in a competition with the US, which intervened in early August with aerial operations to help Kurdish forces push back the jihadist threat. Opposition leader Mehdi Karroubi, held under strict house arrest since February 2011, has been hospitalized because of gastrointestinal complications. Karroubi, who turns 77 tomorrow, has been suffering from shingles and severe knee pain for a month but was only taken to hospital on Wednesday. Karroubi’s wife Fatemeh said that, despite the promises of President Rouhani to free political prisoners, there had been no significant changes in her husband’s situation since the change of government last August. Mir Hossein Mousavi, also a Presidential candidate in the disputed 2009 election and detained at the same time as Karroubi, was taken to hospital last week for eye surgery.